Soak sun-dried tomatoes in the olive oil for 2 hours or overnight, if possible. In a blender or food processor, process the cilantro, soaked tomatoes and their oil, chiles, garlic, and brown sugar. Process until the mixture is smooth, scraping down the sides of the blender or bowl with a rubber spatula as needed. Season to taste with the salt and pepper. 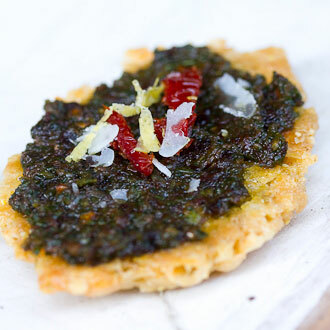 Spread pesto on top of cracker, or use as an alternative to basil pesto on pasta.